Stolen from With Sprinkles on Top, with my thanks! 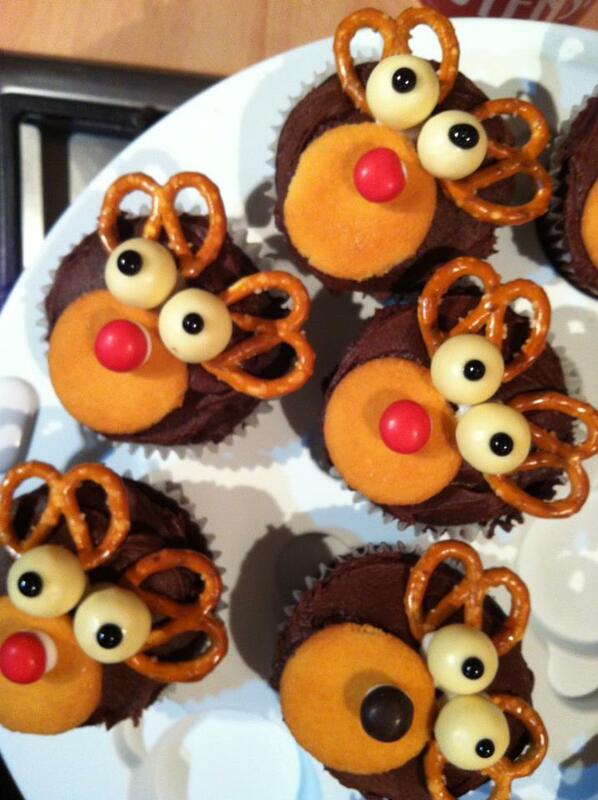 Maybe it's middle age and maybe it's motherhood, but I had to find an excuse to make these. My inner Martha Stewart demanded that I put down the gin and tonic and fashion cute cupcakes. As a bonus, they kept Mia occupied and happy, as she was put in charge of noses. 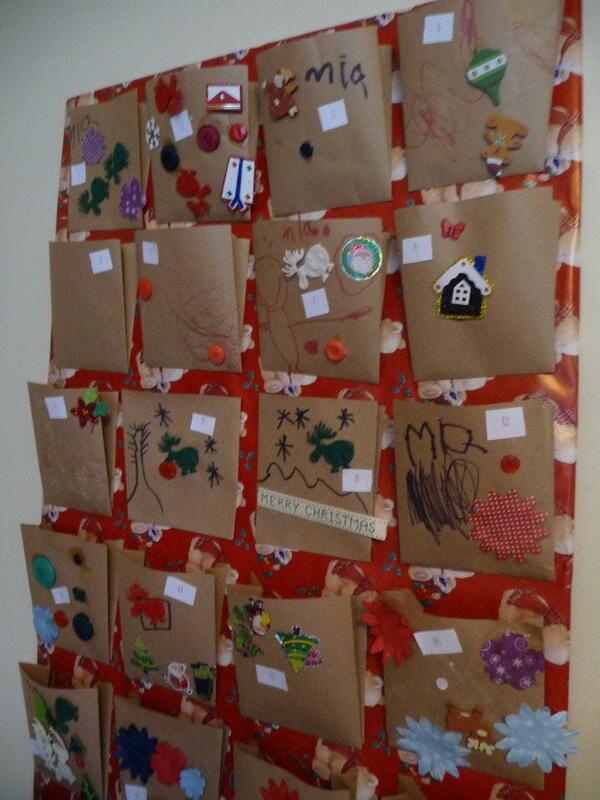 The second Christmas crafty endeavour was inspired by Craftastica and her recycle bin advent calendar. Although ours isn't nearly as tidy as hers, the kids enjoyed putting it together (despite all the fighting about things like stickers, the number of envelopes decorated, and who got to use the coveted glue stick.) The envelopes are made from parcel paper (I had a roll of it around, thanks to many years of sending parcels home to Mom and Dad), the main board is the side of a box I got from Amazon recently, the board is covered in cheapie wrapping paper, and the decorations are from various stores. I'd like to think of it as "folksy". 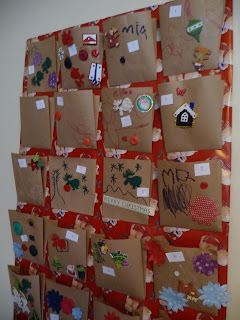 I've been meaning to make our own advent calendar for years now, mostly because I'm too cheap to buy one. I had the idea last year to make one out of felt (how hard could it be? ), but never got around to actually purchasing any felt. What I liked about the homemade/unfilled calendars is that you can put whatever you want inside. Sure the kids love their chocolate calendars from Grandma, but I love the idea of filling each pocket with things other than sweets or toys. Again, this is probably middle age talking and I'm doing something akin to handing out apples at Halloween. But I digress. Erm...maybe stick a toy in the envelope. I'm running out of ideas here. I think this is amazing. and it's totally changed my opinion on 'big' advent calendars. When I was little, chocolate advent calendars were rare, picture ones were the norm (at least amongst my sunday school attending friends). As chocolate began to appear, we didn't have them in our house. All that chocolate at christmas, why would you have more before hand? and other sentiments were bandied about. Probably in truth my parents didn't want anything else to make us bounce off the walls at 7am- we were excited enough about getting up to open a little picture! So I've always viewed these big, fancy, home made advent calendars with some suspicion. 24 presents??? How greedy/materialistic/forgetting the point etc etc I would think. This probably wasn't helped by the fact that the very first one I properly came across was my best friend Na, whose mother was missing her while she was at uni, and so, because her exams fell over her birthday (and advent) sent her an advent calendar or exam treats- lots of intentional spoiling, a bigger prezzie on her birthday and a weight, gosh-doesn't-that-look-like-a-bottle-of-baileys shaped 'hanging' for the day of her last exam. a different intent but it made an impression on me. But I *love* your ideas. Sure, some of them are 'things'. but probably more are about preparation for christmas, which is just fun, and some of them are about other people. I love it! Making the fun of christmas include sharing old toys? Brilliant! Using it as a trigger to get present making/letter writing done on time? Inspired! (Our 'tape for granny' was always done very last minute, in the pre-internet era! Can anyone think of a song? the cry would go). Yes, exactly - advent calendars just had pictures in them when I was little and I was never allowed the chocolate variety. But having said that, it was still very exciting to count down to Christmas even if it just meant getting a picture of a star or a camel!